From baby True to mama Kris, everyone has amazing costumes for the big day. The Kardashian and Jenner clan take Halloween seriously, as evidenced by their multitude of looks this year. 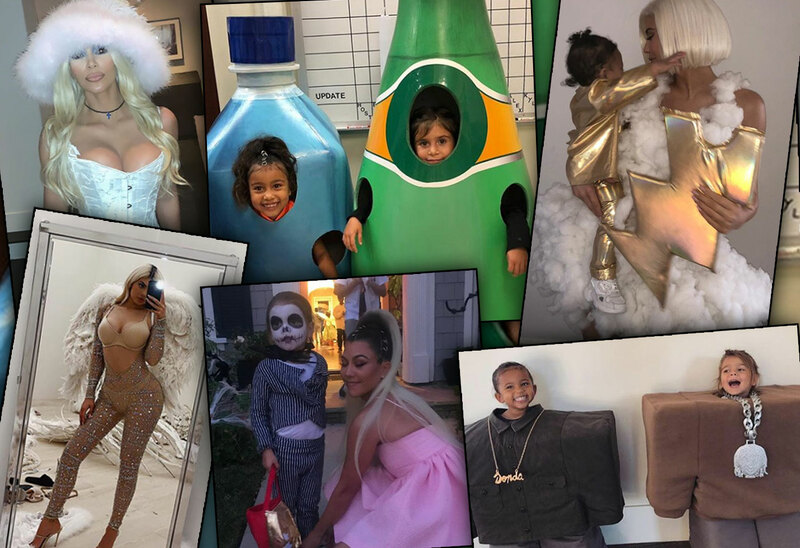 From angels to flamingos, from Kanye West to Ariana Grande – Kim, Kourtney, Khloe, Kylie, Kendall, Kris, and all the kids had every conceivable costume covered. Click through the gallery to see these incredible Halloween costumes. The five sisters first borrowed some costumes from Kendall's employer and went out as Victoria's Secret angels. Each woman had her own lingerie and huge, white feathered wings. Kim, 38, wrote on Instagram, "Thank you @VictoriasSecret for sending us actual runway looks and real wings to borrow for the night!!! OMG a dream come true! Got to be a Victoria Secret Angel for the night! And Kendall got good practice lol." On Twitter, she called her sisters "Forever my angels." Kendall, 22, still got to play pretend, though. Over the weekend, she dressed as a Fembot from Austin Powers. Her nephew Mason must have taken some inspiration from her, as the 8-year-old dressed up as Dr. Evil from the same film, complete with a bald cap. Last night, October 31, Kim dressed as a real person in a white corset and fuzzy hat. On her Instagram Story, she couldn't believe that none of the young people at the Halloween party knew who she was supposed to be. Thankfully 21-year-old Kylie knew right away. The reality star was dressed as Pamela Anderson at the 1999 MTV VMAs. Kourtney, 39, kept the real people trend alive with her Ariana Grande look. She wore a baby doll dress, matching thigh high boots, and — of course — a huge ponytail. Reign was more traditional for trick-or-treating, dressed as Jack Skellington from The Nightmare Before Christmas. But the 4-year-old was uncle Kanye earlier in the day with cousin Saint. They dressed as Yeezy and Lil Pump in the "I Love It" video. Meanwhile, North and Penelope dressed as the two rappers from their performance on Saturday Night Live. North was a bottle of Fiji water, while Penelope was Perrier. Baby Stormi, meanwhile, also joined in the costume-changing fun. She was a literal lightening bolt in a storm, while mom Kylie was the clouds. Earlier in the week, the beauty mogul dressed them both up as matching butterflies. Khloe was in Cleveland yesterday with Tristan Thompson, but she still had time for one last costume for True — a flamingo! She shared tons of other costumes she's dressed the 6-month-old in lately on Instagram, including a panda, a tiger, and a unicorn. Kylie snuck in one last look — a pineapple Fanta girl from the classic commercials. Mama Kris, 62, meanwhile, was Cleopatra decked in gold. Which Kardashian costume did you like best? Sound off in the comments!